Class & panoramic photos will be taken tomorrow, Wednesday, April 15th. Students must in full school uniform. For the Month of April students will focus on the virtue of courage. Courage is one of the four cardinal virtues, more commonly refered to as fortitude. When we think of courage we tend to associate it with bravery. However, courage is more than just bravery. We want our children to know that courage is having the ability to strenghten ones own mind. It is the virtue by which one meets and sustains difficulties and yet is not deterred from the pursuit of good. Moral courage is the ability to act rightly in the face of popular opposition. As Catholics it takes deep courage to attend to our faith when popular opinion and media say otherwise. We hope that this month, students will have opportunities to strengthen their minds. 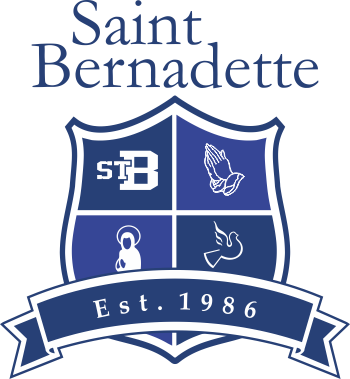 On Thursday April 16th the school will be celebrating the Feast Day of St. Bernadette. We will be serving cake after mass and at 10:45am we will be showing the film St. Bernadette of Lourdes in the school gym. Everyone is welcome to attend. Our Mother’s Day Tea will be held on Friday, May 8th from 10:00am to 11:30AM following the 9:00 Mass. Please join us for morning Mass followed by a performance and light refreshments in the Parish Centre. To help us to prepare for this event please send in your pink forms to school no later than April 24th. If you must drop something off to your child(ren) bring it to the office with their name and grade on it. The item will then be placed in the green basket outside your child’s classroom. This will allow us not to disrupt the class during their lessons. All visitors (including parents) must report to the office. Students in Kindergarten, Grade 1 and Grade 2 are holding a fundraiser for Canadian Development and Peace by selling plants on Tuesday, May 5 just in time for Mother’s Day. Kindergarten and Grade 1 will be selling plants that they have grown during their Science unit and Grade 2 will be the cashiers to build on their Math unit about coins. We are also selling (by pre-order only) beautiful plants from De Vry Greenhouses which would make great Mother’s Day gifts. Please complete the attached order form and return to the school with payment by Fri. April 24. Mark your calendars for pick up of plants and sale of Kindergarten and Grade 1 plants on Tuesday, May 5. If you have any questions, please contact Mrs Fraser, Mme Peck, Mrs Hillard or Mrs Schollen at the school. Thank you for your support. On Thursday April 23rd at 7pm in the school gym, St. Bernadette School will be hosting a Parent Support Meeting for parents of children in grade 4, 6, and 7 currently in Catholic or public school. This night is designed to empower parents to recognize their role as primary educators in faith and truth in human sexuality. The objective of this evening is for parents to gain confidence in their ability to communicate about sexuality to their children. For more information please contact Fr. Paul, Mr. van der Pauw (school principal), or Lisa Balazs (PREP coordinator). All proceeds raised go to Holy Cross Regional Secondary. Tickets are just $30.00 and going fast! Mr. Bill VanderZalm, LIVE Auctioneer will bring a truck load of plants just in time for Mother’s Day! Donations for LIVE or Silent Auction are welcomed and appreciated; drop off at HC school office any day between 8:30am and 3:30pm. Come have fun and support Holy Cross.